Pretty Good Solitaire is a collection of 700 solitaire card games, from classic games like Klondike, FreeCell, and Spider, to original games found nowhere else. Pretty Good Solitaire features lush graphics, beautiful easy-to-read cards, sound, in-depth statistics, a wizard that allows you to create your own solitaire games, and solitaire quests, a unique new way to play solitaire for points. Pretty Good Solitaire is a collection of 700 solitaire card games, from classic games like Klondike, FreeCell, and Spider, to original games found nowhere else. 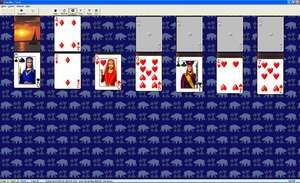 Pretty Good Solitaire 19.0 is a shareware program and can be used as a demo to try the software until the free trial period has ended. A full version of the program is available after the trial period ends. For security reasons, you should also check out the Pretty Good Solitaire download at LO4D.com which includes virus and malware tests. Additional screenshots of this application download may be available, too.